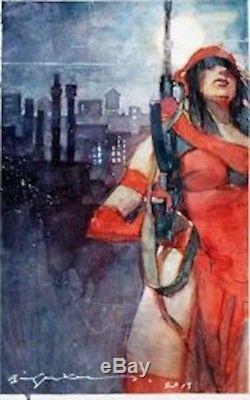 Bill Sienkiewicz - Elektra Painting Original Art (2013). This image of a well-armed Elektra conjures up both beauty and danger, as is befitting the feared assassin and ex-lover of Daredevil. A stunning work by one of the men most closely associated with her, Bill Sienkiewicz. Produced in ink and watercolor over graphite on Bristol board with a 10" x 15.75" image area. Signed and dated in the lower image area. 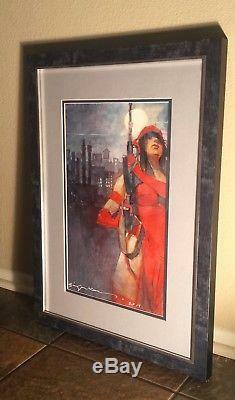 The item "Sienkiewicz Bill ELEKTRA Original comic art painting. Framed Daredevil" is in sale since Sunday, July 22, 2018. This item is in the category "Collectibles\Comics\Original Comic Art\Paintings".